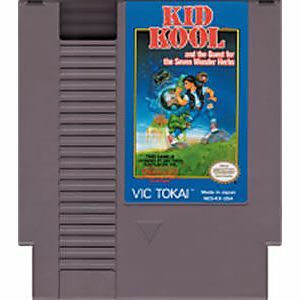 Kid Kool original NES Nintendo Game cartridge only - Cleaned Tested and Guaranteed to Work! This is a rare game. People I know haven't played it. It's a Mario type game. Worked the first time and looks brand new. 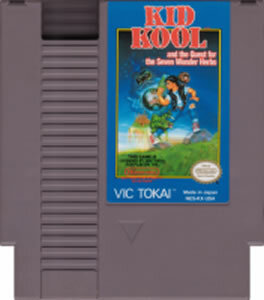 Kid Kool is simple. 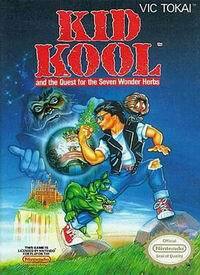 You run and jump your way to get to the end of a level. Along the way, you find a small furball you can throw at enemies to kill them, or you can jump on them multiple times. It sounds fun, and could be, but the problems outweigh the good. You can't go back left once you've walked to far right, making for jumps you may get stuck on, and hidden objects are usually placed to mess up your jumps. It makes for what should be a good game a frustrating experience.